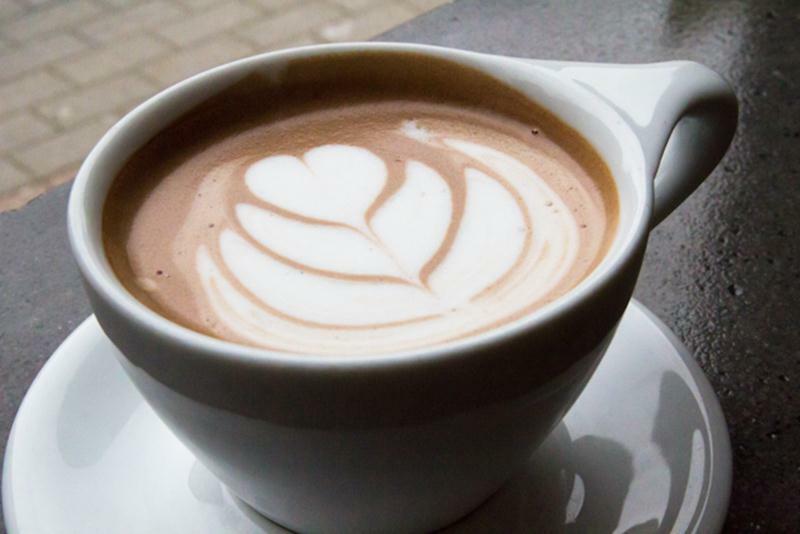 There's nothing cozier than a warm cup of hot chocolate during the chilly winter months. However, there's a dark side to the chocolate industry, and I'm not talking about yummy dark chocolate. According to Green America, "Cocoa is a $16 billion a year industry, but the average annual revenue the cocoa farmers receives is between $30 and $110 per household." A 2010 report by The State Department's shows that young children are being traded as labor for West African cocoa plantations and furthermore, Global Exchange notes that at least 284,000 children are involved in abusive labor conditions in West Africa’s cocoa fields. Hot chocolate becomes a lot less cozy when you imagine little kids slaving and being abused to make that cocoa you're enjoying. Plus, consider all the chemicals and icky stuff added to many conventional hot chocolate mixes, and well, you may want to switch to organic apple cider. However, you can still enjoy this winter treat with your family and make a difference at the same time. Green America reports that certified Fair Trade chocolate has given over 42,000 cocoa farmers in West Africa, the Caribbean, and the Americas a decent price for their crop. Going Fair Trade is a sure way to make sure that hot chocolate you're sipping isn't causes turmoil for another family. Making homemade Fair Trade hot chocolate doubly protects you, because you, and only you decide what goes into your hot chocolate, and more importantly, your family. Read on to learn how to make a delicious homemade hot chocolate brew, that's also a little more healthy for your family this winter. When looking at chocolate bars, note that bittersweet chocolate has less sugar than semisweet, so bittersweet produces a richer, less sweet chocolate flavor. You may also see different cacao percentages. A high cacao percentage means that more chocolate solids are in the bar than a lower percentage bar, i.e. equaling a more intense chocolate taste. 100% cacao, or baking bars of chocolate can be used for hot chocolate, but you’ll need to add a fair amount of sugar as it’s totally unsweetened. Milk chocolate doesn’t work well as it has a lot of milk solids and usually a much lower cacao percentage. To make 4 servings of this type of hot chocolate chop 8 ounces of chocolate into small chunks. Pour 4 cups of organic milk into a saucepan and slowly bring it to a low simmer. Whisk your milk so it doesn’t stick or burn. Once your milk is simmering, add the chocolate along with a teaspoon of organic vanilla extract and 3 teaspoons of powdered organic sugar to the milk and whisk as it continues to simmer, until the chocolate is melted. Continue to heat for another 4 to 5 minutes. Serve. In place of the powdered sugar you can use 1 to 3 teaspoons of white organic sugar to taste. 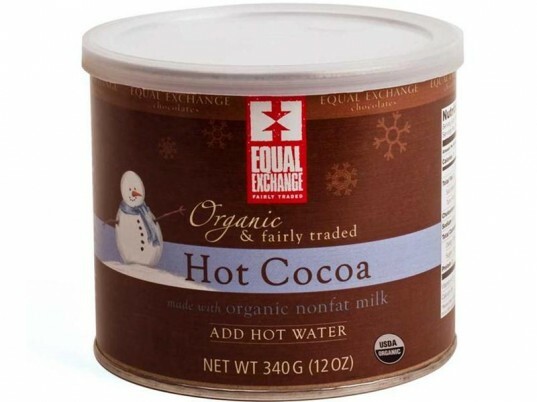 For a richer version of whole bar hot chocolate, mix one cup organic milk, one cup organic half & half, about eight teaspoons organic sugar, one ounce semisweet Fair Trade chocolate crumbled up or chopped, and one ounce unsweetened Fair Trade chocolate, crumbled or chopped in a sauce pan or in double boiler. Heat on low until all your sugar dissolves. Add a few drops of pure vanilla extract and mix well. Makes two servings. Homemade hot cocoa with baking cocoa is my favorite. Although it’s a slight taste notch below hot cocoa made with squares of chocolate, it still tastes great but it’s much easier. To make a nice cup of this homemade hot chocolate, simply combine 1 tablespoon Fair Trade cocoa powder, 2 tablespoons organic sugar and a few tablespoons of organic milk in a small saucepan. Heat this mixture on low and stir continually until a paste forms. Add about a cup more of organic milk and a dash of real organic vanilla extract. Heat to the desired temperature slowly, so you don’t scald the milk and serve. 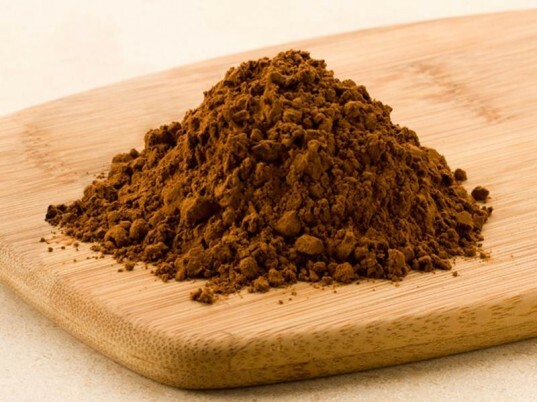 Note, to find less expensive cocoa powder, check the bulk section at your local co-op or natural food store. Often they’ll have organic. Photo © Flickr user PinkStock Photos! There actually aren’t too many organic, Fair Trade chocolate syrups around. Also, so far as taste goes, you’re better off making hot chocolate with real chocolate or cocoa powder. Now, that said, syrups are good when time is tight and you want hot cocoa made with milk, not water. Syrups are also good if you like a lighter, less rich chocolate flavor. Also, syrups are easy for kids to use alone and can be used for plain old chocolate milk or an ice cream topping too, plus it’s fun to drizzle it on top of whipped cream. To make hot cocoa with syrup, follow the directions on the package or mix a cup of organic milk with three tablespoons Fair Trade chocolate syrup. Heat, serve. Rapture Organic Syrup– vegan syrup made with single origin, organic ingredients plus no soy, dairy, gluten or preservatives check at your local store or email the company to order. Dagoba Organic Chocolate Syrup – owned by big bad Hershey who do exploit children with their chocolate, but as a stand alone product, this syrup is officially organic, Fair Trade, and corn-syrup free. Santa Cruz Organic Chocolate Syrup – not Fair Trade but certified organic, no corn syrup and easy to find. Make your own organic chocolate syrup. 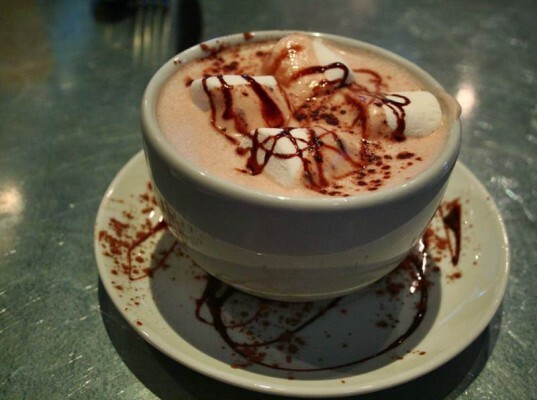 Marshmallows and other tasty add-ins are a must for many when it comes to hot chocolate. Keep in mind though, that most marshmallows are made with animal derived gelatin and many flavored syrups and whipped creams have added chemicals. 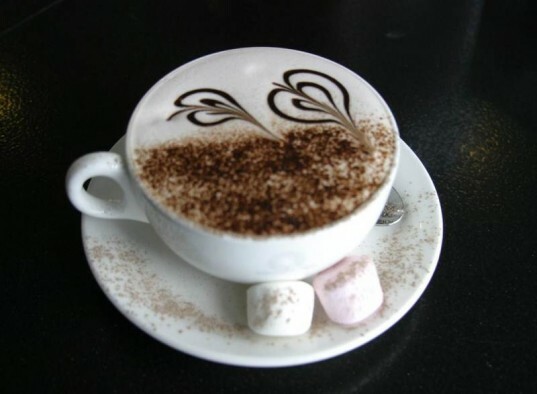 Still, if you like to add a little bling to your cocoa and want to keep it clean, try the following. Score vegan marshmallows from Dandies or Sweet & Sara. For absolutely gorgeous handmade marshmallows visit Have It Sweet. Have It Sweet makes beautiful handmade marshmallows with all natural ingredients and packages them sustainably. Plus they offer amazing choices like Pink Peppermint Swirl Marshmallows, Cinnamon Marshmallows, Sugar Cookie Marshmallows and more. Café Kakow Organic Syrups: vegan, single origin, no preservatives (hazelnut, almond, caramel and vanilla). Hot chocolate is more than a simple yummy treat. Hot chocolate has been proven to sooth sore throats, has more antioxidants than tea or wine and may even boost brain power and protect cardiovascular health. Go hot chocolate! This is the perfect drink for cold and flu season. Still, there’s no reason why you can’t make this treat even healthier for your family. To calm a sore tummy add a few drops of pure organic peppermint extract. Organic dried ginger adds a unique flavor to hot chocolate and also helps fight off morning sickness. Use coconut milk in place of part of your other milk. Coconut milk has been shown to contain various lipids and acids, which may help fight off viruses such as influenza. To pump up the already present antioxidants, add a shot of pure organic cherry juice or blueberry juice. Try squeezing fresh orange juice or carrot juice into your cocoa for vitamin A and C. You’ll have to adjust your sweeteners to taste. Add flavor and multiple health benefits with dashes of freshly ground cinnamon, cloves, nutmeg or cayenne. When looking at chocolate bars, note that bittersweet chocolate has less sugar than semisweet, so bittersweet produces a richer, less sweet chocolate flavor. You may also see different cacao percentages. 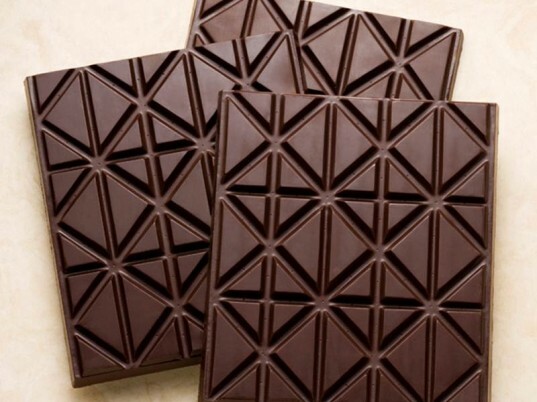 A high cacao percentage means that more chocolate solids are in the bar than a lower percentage bar, i.e. equaling a more intense chocolate taste. 100% cacao, or baking bars of chocolate can be used for hot chocolate, but you'll need to add a fair amount of sugar as it's totally unsweetened. Milk chocolate doesn't work well as it has a lot of milk solids and usually a much lower cacao percentage. To make 4 servings of this type of hot chocolate chop 8 ounces of chocolate into small chunks. Pour 4 cups of organic milk into a saucepan and slowly bring it to a low simmer. Whisk your milk so it doesn't stick or burn. Once your milk is simmering, add the chocolate along with a teaspoon of organic vanilla extract and 3 teaspoons of powdered organic sugar to the milk and whisk as it continues to simmer, until the chocolate is melted. Continue to heat for another 4 to 5 minutes. Serve. In place of the powdered sugar you can use 1 to 3 teaspoons of white organic sugar to taste. Homemade hot cocoa with baking cocoa is my favorite. Although it's a slight taste notch below hot cocoa made with squares of chocolate, it still tastes great but it's much easier. To make a nice cup of this homemade hot chocolate, simply combine 1 tbsp. Fair Trade cocoa powder, 2 tablespoons organic sugar and a few tablespoons of organic milk in a small saucepan. Heat this mixture on low and stir continually until a paste forms. Add about a cup more of organic milk and a dash of real organic vanilla extract. Heat to the desired temperature slowly, so you don't scald the milk and serve. Note, to find less expensive cocoa powder, check the bulk section at your local co-op or natural food store. Often they'll have organic. There actually aren't too many organic, Fair Trade chocolate syrups around. Also, so far as taste goes, you're better off making hot chocolate with real chocolate or cocoa powder. Now, that said, syrups are good when time is tight and you want hot cocoa made with milk, not water. Syrups are also good if you like a lighter, less rich chocolate flavor. Also, syrups are easy for kids to use alone and can be used for plain old chocolate milk or an ice cream topping too, plus it's fun to drizzle it on top of whipped cream. To make hot cocoa with syrup, follow the directions on the package or mix a cup of organic milk with three tablespoons Fair Trade chocolate syrup. Heat, serve. Rapture Organic Syrup- vegan syrup made with single origin, organic ingredients plus no soy, dairy, gluten or preservatives check at your local store or email the company to order. Dagoba Organic Chocolate Syrup - owned by big bad Hershey who do exploit children with their chocolate, but as a stand alone product, this syrup is officially organic, Fair Trade, and corn-syrup free. Santa Cruz Organic Chocolate Syrup - not Fair Trade but certified organic, no corn syrup and easy to find. Make your own organic chocolate syrup. Marshmallows and other tasty add-ins are a must for many when it comes to hot chocolate. Keep in mind though, that most marshmallows are made with animal derived gelatin and many flavored syrups and whipped creams have added chemicals. Still, if you like to add a little bling to your cocoa and want to keep it clean, try the following. Score vegan marshmallows from Dandies or Sweet & Sara. 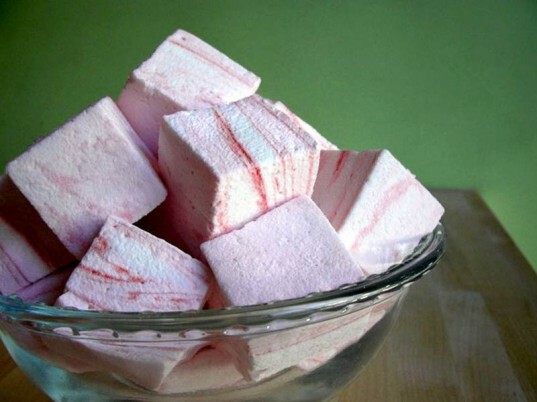 For absolutely gorgeous handmade marshmallows visit Have It Sweet. Have It Sweet makes beautiful handmade marshmallows with all natural ingredients and packages them sustainably. Plus they offer amazing choices like Pink Peppermint Swirl Marshmallows, Cinnamon Marshmallows, Sugar Cookie Marshmallows and more. Café Kakow Organic Syrups: vegan, single origin, no preservatives (hazelnut, almond, caramel and vanilla). Homemade organic whipped cream. Hot chocolate is more than a simple yummy treat. Hot chocolate has been proven to sooth sore throats, has more antioxidants than tea or wine and may even boost brain power and protect cardiovascular health. Go hot chocolate! This is the perfect drink for cold and flu season. Still, there's no reason why you can't make this treat even healthier for your family. To calm a sore tummy add a few drops of pure organic peppermint extract. Organic dried ginger adds a unique flavor to hot chocolate and also helps fight off morning sickness. Use coconut milk in place of part of your other milk. Coconut milk has been shown to contain various lipids and acids, which may help fight off viruses such as influenza. To pump up the already present antioxidants, add a shot of pure organic cherry juice or blueberry juice. Try squeezing fresh orange juice or carrot juice into your cocoa for vitamin A and C. You'll have to adjust your sweeteners to taste. Add flavor and multiple health benefits with dashes of freshly ground cinnamon, cloves, nutmeg or cayenne.